Welcome to the April edition of FlightGear's monthly newsletter! It's been a month full of exciting developments, ranging from a massive Russian spacecraft, to a little American instrument. In between you'll find Japanese and Belgium airports and a German helicopter. That is what I call a true international project! Zan has been working very hard on an experimental atmospheric scattering shader. The shaders makes use of Sean O'Neil's algorithm. Altough there are some issues with the shader, it looks like it will have a promising future! Some screenshots are available at the forum thread . The shader does some simplifications, but basically tries to recreate physical phenomenom, so the look could be easily modified depending on environmental conditions. But since the values are not so easy to figure out, some testing would be needed for creating nice looking sky for misty weather, rainy weather, cold winter etc. After that, proper equations could be written to transform weather values to scattering parameters. The shader is not production ready; it has some bugs and terrain (especially fog at horizon) does not match the looks of the skydome. This is a work in process, but might take some time, because the terrain shader is much harder than the skydome shader. Meanwhile the shader is available in Git, and the various adjustable parameters are accessible in the Gui under View > Rendering Options > Experimental Effects. The moving map on the Airbus A340-300. Work on the Airbus A340-300 is going slowly but surely as Skyop and Ampere progress on the model and cockpit. Skyop is currently developing a new instrument, a virtual moving map that displays multiplayer pilots, AI traffic, selected VORs, and terrain elevation! It is hoped that the instrument, which is designed to be reusable across more aircraft besides the A340, will eventually be a viable 3d alternative to the 2d "wxradar" instrument. TCAS and weather radar are on the roadmap to completion. When finished, the instrument will be committed to Git under Aircraft/Instruments-3d. Unfortunately, the terrain display has several drawbacks. It is very pixelated because FlightGear cannot handle very many terrain elevation calculations at once. Therefore, the map has the ability to display "low-resolution" terrain mode (minimal FPS impact) and "high-resolution" terrain mode (severe FPS impact). The Boeing 777-200ER's chronometer has been moved to the generic instruments directory (Aircraft/Instruments-3d/chronometer). This allows aircraft developers to easily implement this clock in their aircraft. All related Nasal code was included in the model xml file, so there's really just one file to be linked to! Some aircraft already make use of this clock, including the Boeing 747-400 and 757-200. Easy to be re-used in other aircraft, all you need to do is link to (and position) the model and on some instruments link to a Nasal file. If someone extents the functionality of a generic instrument, it will be automatically extended in all the aircraft that use it. To celebrate Yury Gagarin's historical flight, Vostok-1 carrier and spacecraft were added to FlightGear. In heavy development still, it already allows full orbital flight from lift-off to landing, making it perform the first spaceflight in FlightGear. JSBSim centrifugal force addition made the whole flight available. JSBSim property driven point masses, tanks and engines, and aerodynamic coefficients implementation allow stages changing. Each single stage of the flight has an independent mass scheme, propulsion system, and aerodynamics reactions, so simulation is more or less realistic. Datcom+ with "little wing" approach resolves carrier and spacecraft aerodynamics accurately enough to make flights on real fuel and oxidizer capacities with real g forces, orbit and deorbit paths. Zan's shader makes the earth look pretty enough from high altitudes. FG improvement shifted practical flight ceiling from 80 to 160 kilometers. In real life, the first human spaceflight was fully automated. In FlightGear, instead controls are completely manual to make it interesting, and to make you understand how it really works. Authors and developers, since orbital flight is possible in FlightGear from now on, you are invited to make a FlightGear driven Mercury-Atlas project. Low earth orbit flights can be more exact and eyecandy in FlightGear than in any current simulator. And you can be sure it will be free for you and users in any case. While work on the fdm is mostly finished and only small things on the exterior model have to be done, work on the cockpit of the BK 117 has begun and is making good progress. 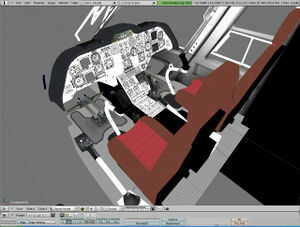 The cockpit will be detailed and make use of photorealistic textures and as a lot of new instruments and panels will be created, this is mostly a modeling challenge. The b1900d-cockpit is guide for the developement to keep the aircraft framerate-friendly. Because of the complex cockpit a specific AI-model will be created to keep MP-Users happy. This development is also a test for the upcoming EC135/635-project, which will also have a detailed and accurate cockpit with photorealistic textures. The images for the textures are taken by the former user and developer heliflyer, who was an emergency doctor on Bo105, BK117 and EC135 in Northern Germany. Vinura has started work on developing a Doctor Who TARDIS for FlightGear. The exterior model is almost complete in SketchUp. Click here for the development thread. 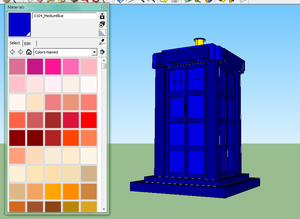 Currently, he still needs to get the TARDIS colours right as it is only allowed to use 'Named Colours' from Google SketchUp as they can't claim copyright on colours. The 3d cockpit of the ATR 72. After a long five months, Skyop has completed the ATR 72-500, which finally features a complete cockpit and aircraft systems. Highlights include an advanced autopilot, hydraulics system, tiller steering system, an interior cabin, and new documentation. The aircraft has been committed to Git and will hopefully be available in the next release of FlightGear. It is now one of the most advanced turboprops for FlightGear, right behind the B1900d. Rumour has it that our Airbus A340-600 is now completely different... Users will get to see it in next months newsletter. 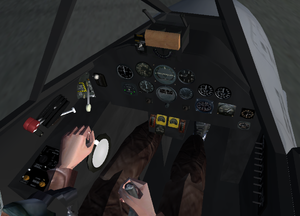 As per a suggestion from Gooneybird, Armchair Ace has extensively developed the Gloster Meteor F.3's cockpit. At the same time, Jentron has started work on a highly detailed JSBsim FDM, using tools such as DATCOM. Some SriLankan Airlines liveries have been made by Vinura for the Boeing 767 and Airbus A320. Brett created a lot of nice Gloster Meteor liveries. Altough we're slowly getting used to the quality of his liveries, they still amaze lots of users. Robert started painting (and remapping) the DHC-6, providing us some excellent liveries. There are a couple different ways of creating shapefiles for terrain. Here is an overview and hopefully it will help those understand the scenery process a little bit better. See Howto: Create custom scenery for the main article about this subject. This method has been used for St. Maarten in the World Scenery and Rio de Janeiro custom scenery. In this way, you download a satellite photo or an aerial photo and create the shapefiles by hand by "drawing" on top of the photo. Land cover data can be either vector like CORINE or raster like NOAA. However if the files are raster you will have to convert them into vector using a similar way described below. European CORINE scenery and most large-scale custom United States scenery such as Hawai'i or the Pacific Northwest were created using available third-party land cover data. There is Switzerland land cover data available for both Bodensee and for most of Switzerland which has been created using land cover classification techniques. In this scenery, the developer takes a satellite photo and, using raster manipulation software such as GRASS, manually classifies each pixel in the satellite as a land cover type. After refining the data, the data is turned into a vector format and cleaned again, removing oddities such as cloud cover. This is probably the most difficult type of scenery to create, but can cover a large area most efficiently. A mix of the last two approaches is usually the most beneficial unless you are using an end-product such as CORINE. For instance, in the new Pacific Northwest sceneries, there are some oddities where rivers start falling under 30m wide. These need to be fixed by hand and then merged which can be a time-consuming process. If you have any questions about creating your own land cover scenery feel free to ask on the forums. This month, 13 new generic buildings have been modeled and textured with day and night textures. The purpose is to use them as placeholders in your big city. They are simple, light and lot's of different colors are available, which i hope, fit your needs. These buildings are actually used at Brussels, near the EBBR airport (north-west) which is currently under heavy development, as you can read elsewhere in this newsletter. You can get these new generic buildings if you use FlightGear Git version or TerraSync. The generic Concourse C at KDEN was recently replaced with a much better, realistic working model featuring animated jetways. Please enjoy. KSFO was also improved with animated jetways. Chubu Centrair (RJGG) is classified as a first class airport and is the main international gateway for the Chūbu ("central") region of Japan, and currently is counted among the Top-10 modern airports of the world. Chubu is an airport on an artificial island in Ise Bay, Tokoname City in Aichi Prefecture, 35 km (22 mi) south of Nagoya in central Japan. Originally a single runway in the middle of the ocean in the default FlightGear terrain, it has now been developed at a high level of detail and realism by Horacio, who has modeled the main terminal (shaped like a "T"), the ATC tower and main hangars surrounding the airport. A second step is to complete the rest of buildings present on the island. The terminal and main buildings have been animated with night textures, which complemented with lights and default 3D airplane models taken from FG package, give the airport a very realistic and fantastic night impression. The main windows have been treated using real pictures to get a photorealistic effect of glass reflection, which gives the model a new approach to 3D graphics in FlightGear development that points to precise and meticulous work to improve the simulation experience and realism in the models used, both aircraft and buildings. With the exception of the photographs used as an effect, all textures have been developed in a sole and exclusive work from scratch, adding bevels, shadows, lights, noise, color equalization and many other effects to get realism in each textures used. The island terrain and surrounding coastline have been developed in an accordingly highly detailed level by Gijs to complete the necesary elements to provide a great new airport for FlightGear, containing all internal roads and railways, which leaves the way open for future works on bridge, parking and other details of vehicular transport to and from the island. Details of development and future updates can be followed on the topic specially created on forum. The airport models and terrain will be available in a few days for to be downloaded in Horacio's hangar, and later available on FG model database. Due to its proximity, the EBBR project includes not only EBBR itself, but also the neighbouring Grimbergen (EBGB), Brussels South (EBCI) and some little stuff here and there around Brussels. As we should recognize, Belgium isn't that big however, EBBR is a big, well organized, high-traffic airport and also a key airport in Europe. The EBBR is a simple, but efficient airport with lots of other little cool-to-visit airfields around there. It could be a nice place for some touristic trips with a little aircraft. There is also a hidden bonus at papillon81's git repo: improved terrain including OSM data. This is really a must have! It includes the highways, rivers and much more accurate elevation and urban data. It just improves the overall graphics and makes the area look simply amazing! Howto get this terrain? Copy at least the Terrain/e000n50/e004n50 tree from papillon81's repo into the tree of the EBBR project. That's it! 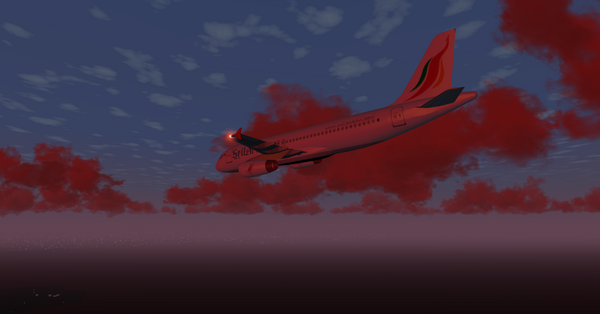 SriLankan Airlines livery on an Airbus A320 taken at dusk. Departing from Brisbane International Airport and heading towards Sydney International Airport at a heading of about 203, you will come across some beautiful scenery. I hope to do a monthly review of a specific aircraft. I can't guarantee that I will get to do it every month though because I do have other stuff to attend to. The Cessna Citation X is by far one of my favourite little planes! Its reaction time is quite quick. The rudder control is very responsive, even the slightest move of your rudder pedals or the mouse and the aircraft's rudder moves. It accelerates quite fast down the runway, building up momentum and then, you lift your joystick up slightly and the nose lifts up just like you want it to. Regarding the animations, they are extraordinary. They function quite well like for example the flaps, spoilers or the landing gear. The cockpit is quite well designed and has a lot of instruments, just like a real Citation would. It has a tutorial system built in for people wanting to fly one. This was the first jet plane that I could actually land properly in. It also has several nice camera views, including views from the passenger seats. I would recommend this plane to people who have already flown planes like the Cessna C172P or the Piper J3 Cub and want to progress into Jet aviation. This is a GREAT little starter plane to get you going. This has to be one of the best planes that I have ever used in FlightGear! Skyop created a lovely video (for the Linuxtag video contest, which was held at the forum) showcasing some of the latest and greatest developments in FlightGear. The video was uploaded in two parts: part 1, part 2. It will be shown in Berlin, to attract new FlightGear users and developers. From 11 till 14 May, FlightGear will be present at Linuxtag 2011 in Berlin, Germany. A preview of what the FlightGear guys will be showing was posted at our forum. If you are able to drop Berlin a visit, feel welcome to stop over at our booth. The FGFC "Mayday 1: Manitoba Rescue" operation was held April 2nd, 2011 at CYAV, Winnipeg/St.Andrews, with seven pilots participating. The scenario stated two of Manitoba's major rivers were flooding, and people were stranded along both, so STOL and helicopter pilots were mustered at CYAV, received assignments from ATC, planned their flights, and notified ATC when they were ready to proceed. A total of twenty missions were assigned, sixteen of which were successfully completed in the space of three hours. The scenario was based around the idea that pilots should have basic skills in addition to merely flying with an autopilot, and was designed to test both their actual flying ability by not having airports at their destinations, and providing no actual navigational data beyond a map or two. They were required to map their routes in territory unknown to them, then fly those routes in their chosen aircraft, land, report in, then return to CYAV to complete a "cycle." Points were awarded for cycle completion, and points deducted for aircraft crashes. FG Seg faults were not penalized. Comments back about the operation from pilots have so far been positive. Watch the Multiplayer Forums for the next one; there will be one, but at the time of writing, it has not yet been decided. This page was last modified on 12 March 2016, at 11:22.